Update, February 13: Konami has explained why Metal Gear Solid V’s ‘nuclear disarmament’ event triggered last week. Konami says that Metal Gear Solid V’s nuclear disarmament event triggered last week because its servers were fed “incorrect values.” In a pair of tweets, the developers apologised to players. Want shambling corpses? Even if they’re not made of crystal, we’ve got you covered with the best zombie games on PC. Update, February 5:Konami have confirmed that the reveal of the disarmament ending wasn’t supposed to happen. The bizarre, sudden unlock of Metal Gear Solid V’s final cutscene appears to have been a glitch, as Konami have confirmed both that it happened and that it wasn’t intentional. The cutscene was supposed to be tied to a complete removal of nuclear devices from player bases on a given platform, and despite the PC version being thousands of nukes away from zero, the scene triggered a few days ago. But while the simplest explanation seemed to be that Konami had pushed out the scene early as a stunt to promote Metal Gear Survive, that wasn’t the case, as the publisher confirmed on Twitter. The scene unlocked only on PC, which gave the community pause as to whether this was an official action from the publishers. Some are speculating that an overflow error triggered the event, and there’ve been a number of suspicious, sudden changes to the PC nuke count over the past month. Original story, February 2: I’m pretty sure the statute of limitations on Metal Gear Solid V spoilers is up – it’s been years at this point – but just in case here’s your warning that you’re about to see a bunch of MGS5 spoilers. All good? Okay. Not long after the game’s original release, dataminers dug up a secret cutscene that seemedpractically impossible to unlock under normal circumstances, requiring every single nuclear device on every single online player’s base to be dismantled. Nobody’s quite sure why the scene has unlocked, though many suspect Konami are fudging the numbers a bit to close the book on MGS5 ahead of the launch of Metal Gear Survive. The scene’s been widely reported on PC, with a few still-unconfirmed suggestions that it’s popped up on Xbox One, though nobody on PS4 seems to be claiming to have seen it yet. 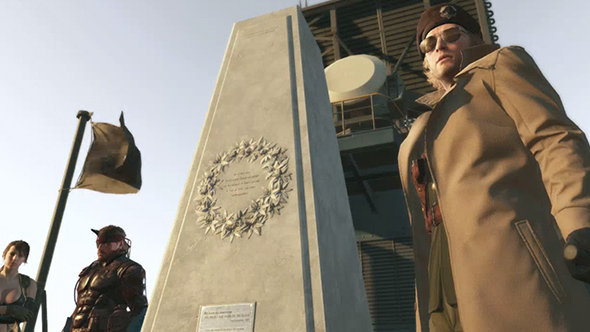 The disarmament ending is tied to the game’s now-mythical chapter three, which conspiratorial players have been seeking out the supposed final part of MGS5. The bulk of The Phantom Pain’s story is told in chapter one, with chapter two tying up a handful of plot threads before meandering off. A combination of disappointment over the story’s lack of resolution, cut content teased by behind-the-scenes material, and director Hideo Kojima’s penchant for metagame plot twists and marketing stunts led many fans to hope there would be a chapter three with loads more content. Most of that speculation died off during the messy break-up between Kojima and Konami, but there was one last little unresolved detail: the disarmament ending. But now that ending is here, and there’s not much left to be said. There’ll still be certain corners of the internet proudly signalling “never be game over,” but between the upcoming release of Metal Gear Survive from Konami and Death Stranding from Kojima, it seems all parties involved have moved on. And even if disarmament reveals there never truly was a chapter three, isn’t the sensation that something is missing what The Phantom Pain is all about?